Sticky Rice is a core ingredient of thai desserts and northeastern thai food. Here's how you can make it easily. The sticky rice and coconut milk must be hot in order for the rice to absorb the liquid. The Coconut Milk Sticky Rice should be mildly sweet with a hint of saltiness, serving as a bland base for other toppings such as mangoes or durian sauce. An overly sweet Coconut Milk Sticky Rice will not be able to give its topping a flavor contrast. The Traditional Method Using a Steamer: Soak the sticky rice in enough water to cover the rice for at least an hour and even overnight. Take your steamer, put water in the bottom and cover the steam section with cheese cloth or muslin cloth. Pour the sticky rice on the cheesecloth, cover with the lid and put it on the stove on medium to high heat. 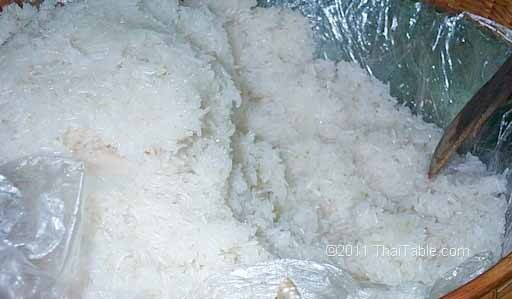 The sticky rice should take about 15-20 minutes to cook and will become translucent when done. The Microwave Method: I learned this method from my friend who has mastered microwave cooking to such a high level of proficiency that she has earned the title 'the microwave queen'. 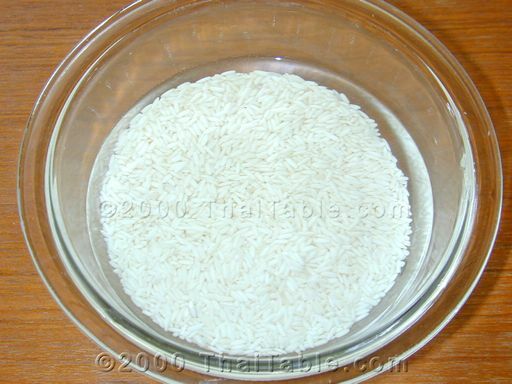 Soak the sticky rice for 10 minutes in warm water in a bowl. Soaking the rice is very important. I have tried this method without soaking the rice first and it was disastrous. The rice was undercooked and inedible. 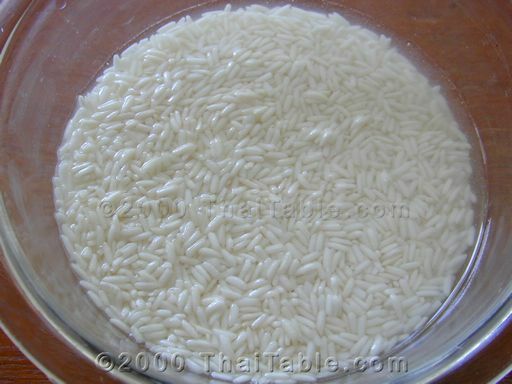 The water level should be just above the rice, which comes out to be 1 cup of rice and a little over 1 cup of water (about 10% more). I recommend using a non-plastic container because you may melt the plastic in the microwave. Cover the bowl with a dish and cook in microwave for at full power 3 minutes. Stir the rice around to move the rice from the top to the bottom. 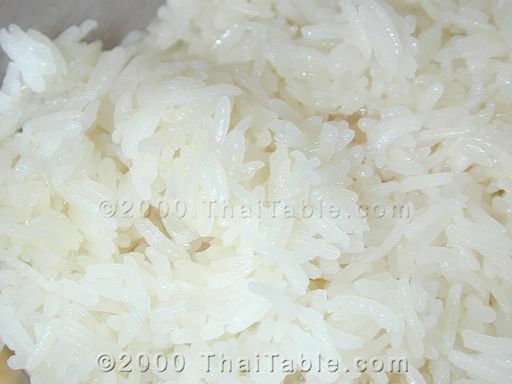 You will notice that some of the rice is translucent or cooked but some still has a white center or the uncooked portion. Heat it up again for another 3 minutes. Check and see if it is done. When cooked, all the rice should be translucent. If it needs more cooking, I recommend heating up and checking every 3 minutes or so. How long it takes to cook really depends on your microwave. Putting it together: Heat the coconut milk in a pot over medium heat. Stir constantly and let the coconut milk simmer. Hard boiled coconut milk will curdle. Add sugar and salt and stir to dissolve. Remove from heat. Pour 3/4 of the hot coconut milk over the hot sticky rice. Let it sit for 5 minutes. The hot sticky rice will absorb all the coconut milk. The rice should be a little mushy. Spoon the rest of the coconut milk on top of the rice at the serving time.